Fit is fun-to-drive, fuel-efficient and feature-loaded, a great combination that makes for a truly appealing hatchback. If this sounds like the type of vehicle you're looking for, visit Vandergriff Honda to find the 2016 Honda Fit in Arlington, Texas! While its compact, when it comes down to it, Fit is really more than the little car that could. It was a winner from the start, with confidence beaming from the inside out. The Car Connection's 2016 Honda Fit review says it offers the best safety in its class and is unmatched when it comes to interior space thanks to its acclaimed Magic Seat, which folds flat and flush with the cargo floor. When the seats are flat, Fit offers an impressive max cargo capacity of 52.7 cubic feet. This is on par with what some small crossovers offer and provides plenty of room for most passenger needs. Every 2016 Honda Fit in Arlington shows off impressive cabin features, too. Standard amenities like Bluetooth Hands-Free Phone and Audio Streaming, as well as a rearview camera, 5-inch color infotainment interface and USB inputs, show the Fit's emphasis on convenience and safety. The Honda LaneWatch blind-spot system (standard on EX trims and above) is another notable feature on the equipment list and it highlights the hatchback's proclivity to integrate purposeful, cutting-edge technology. Another important aspect of Fit is its performance. 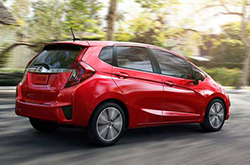 In Edmunds.com's 2016 Honda Fit review editors say that buyers will enjoy the hatchback's nimble feel on winding roads, composed freeway performance and snappy CVT. For your everyday needs, its four-cylinder and CVT (six-speed manual optional) deliver confident performance at high speeds and a few "athletic moves" that make it fun to drive through twists and turns. Of course, for anyone purchasing a subcompact car, efficiency is important and we can tell you that Fit more than delivers when it comes to fuel economy. Most CVT-equipped models get an EPA-estimated 35 mpg combined (32 city/38 highway) according to 2016 data (LX models rank slightly above this), while manual-equipped Fits deliver 32 mpg combined (29 city/37 highway). Try the Honda Fit out for yourself at Vandergriff Honda and we're sure you'll find that it's the right fit for your needs, thanks to its superior combination of efficiency, performance, safety and features! Is the Honda Right for You? Compare Honda's latest model of the Fit to its rivals and we're sure that you'll choose it over vehicles like the 2016 Ford Fiesta, Chevy Sonic and the Kia Rio. Shoppers will love the Fit's affordable pricing, as well as its tasteful styling. 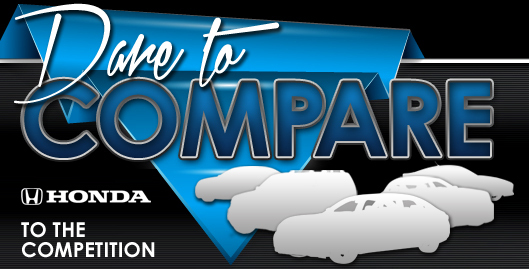 You'll easily see it's a fabulous value when you compare its price to competing vehicles. Take a look at our bullets for more details! 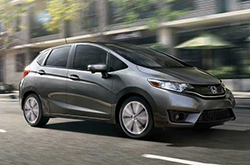 Vandergriff Honda is a trusted resource for information about the 2016 Honda Fit - for reviews of former models please view our sidebar links. With the assistance of some of the best automotive writers in the field, we've managed to get reviews produced for all of our models. Everything perspective car buyers need to make sound decisions is right here, including info regarding cabin features and other specs. Each summary is crammed with important material and specs - all at your fingertips. Now that you've learned all about the 2016 Fit, we'd love to chat about how we can assist you; get in touch with us today to learn about limited-time dealership offers and make an appointment for a test drive!